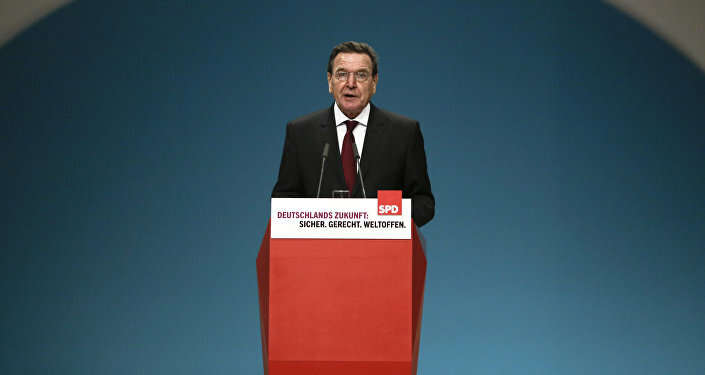 Germany's Die Zeit newspaper has attacked Gehrard Schroeder, a former chancellor, accusing him and much of Germany's political class, of succumbing to economic interests and receiving a political "dragon" has now "hatched" and led to the division of Europe. In an article on the Nord Stream 2 compromise deal between Germany and France, which was reached last week following earlier reports that Paris might try to torpedo the project, Zeit complained that the former chancellor, who played a key role in the development of the Russian-German gas pipeline venture, put Germany at odds with its allies and partners across Europe, from France to Poland to Ukraine. Admitting that there was a lot to be said for the pipeline from an economic point of view, given that "Russia is an important gas supplier for Germany and Europe," Zeit even pointed out that the additional pipeline will not increase Europe's dependence on Russian gas, as if often claimed by its opponents. "Europe has far too many choices amid large supplier countries such as Norway, the Netherlands, Algeria, Azerbaijan, and possibly Cyprus, Egypt and Israel in the future," the paper noted. Moreover, the newly built LNG terminals across the EU will allow Qatari and US gas to be brought to Europe if the need arises. "If Gazprom wants to add to its many [pipelines to Europe] at its own expense, that is not a bad thing for Europe. Each additional line increases security of supplies," Zeit noted. On the other hand, the paper claimed, German officials have almost completely overlooked the "political dimension." This, it suggested, has led to the recent Franco-German friction, to Europe's "mistrust" of Berlin, a split in the EU, and a US bid to strengthen an anti-Nord Stream 2 front to try to sell its own LNG to Europe. "This hostile constellation is one that could have been foreseen by the Germans. From Gerhard Schroeder's cuckoo's egg [in the form of Nord Stream] a dragon has hatched which the Germans cannot get rid of. For too long, they have torpedoed all attempts by the European Commission to standardise the EU's gas policy. Far too late, they began thinking about compensatory contracts for Ukraine. For far too long they have relied on solidarity from France," the newspaper insisted. Now, with permits granted, 600 km of pipeline laid, and massive penalties to be incurred if the project is cancelled, Zeit lamented that it is "hardly possible" to abandon Nord Stream 2. Furthermore, if the project is dismantled, relations with Russia would get even worse, and only Berlin would be to blame, the paper concluded. Zeit's readers were divided on the article's tone and conclusions. A top rated comment noted that "you can say anything you want about Russia, but they've been a reliable supplier since the mid-1980s, without any threats. But who knows? Maybe the Americans will make us an offer we can't refuse." "Comical analysis. All these countries are pursuing their own economic interests, but Germany should hold back in this regard and leave business to others?" another chimed in. "Good article. Genuine. But attacking Shroeder and making him out to be the passive culprit to the division of the EU is shabby, to say the least," another argued. "As a gas customer, I do not feel like paying 25% more for LNG, or sitting here in the cold because Ukraine decides to steal gas meant for Europe and supplied by Russia again," one user suggested, recalling the multiple Russia-Ukraine gas disputes from in the mid-2000s. Nord Stream 2 is a joint venture between Russian gas giant Gazprom and half-a-dozen Western European energy firms. Once completed, it will double Nord Stream's existing capacity, and be able to deliver another 55 billion cubic metres (1.9 trillion cubic feet) of Russian natural gas to European countries per year, bypassing traditional transit countries, such as Ukraine and Poland. Gerhard Schroeder served as Germany's chancellor between 1998 and 2005, devoting considerable attention to improving relations and economic ties with Russia. A key proponent of the original Nord Stream project, he remains chairman of Nord Stream AG, the consortium for the construction and operation of the pipeline.